Indian School Sohar has yet again excelled itself with a 100 per cent pass rate at the All India Senior Secondary School Certificate (Grade XII) Examinations conducted by the Central Board of Secondary Education in March-April 2018. All the 98 students who took the examination this year, 78 in the Science stream and 20 in the Commerce stream were successful - achieving a 100 per cent success for the school. Every single one of them scored first division marks. Leading the charts is Manas Vegi from the Science stream, who topped the school with 98.4 per cent marks. Looking at individual subject streams, following Manas Vegi in the Science stream is Tanya Sanjay Kumar with 96 per cent marks, Amal Najeena Jaleel with 95.2 per cent marks. In the Commerce stream, Nabheen Sobhan topped with 86.6 per cent score. Aakanksha Reu scored 84.2 per cent securing the second position with Sohail Ahmed closely following with 84 per cent marks to clinch the third position. Around 32 per cent students scored more than 90 per cent marks, Principal Sanchita Verma said. 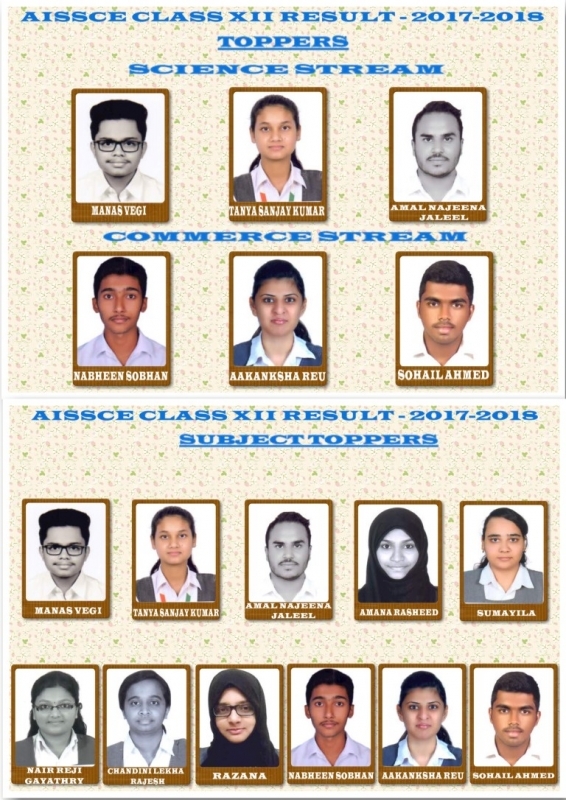 It is indeed an exemplary achievement that 66 out of the 78 students in the Science Stream and 11 out of the 20 students in the Commerce Stream have notched a distinction, while all the students achieved a first division. Manas Vegi secured a perfect score of 100 in both Mathematics and Chemistry. Tanya Sanjay Kumar achieved perfect 100 in Informatics Practices. Gayathry Nair was the top scorer in English with 97 marks, Manas Vegi in Physics with 99 marks, Chandini Lekha Rajesh and Amana Rasheed Ayarath Puthiya in Biology with 94 marks and Nabheen Sobhan with 98 marks in Physical Education. Aakanksha Reu was the top scorer in Economics with 91 marks, Razana Cheriyandeerakath in Entrepreneurship with 91 marks, Nabheen Sobhan 74 in Accountancy, Aakanksha Reu, Sohail Ahmed, Nabheen Sobhan and Sumayila secured a top score of 95 marks in Business Studies. Principal Sanchita Verma said, "'I'm thrilled by the performance of our students. Once again, they have shown their mettle. The unwavering commitment and endeavor of our students and teachers have made this possible. I wish all my students a great future and much happiness. May you always shine bright." Now moving on to the "next chapter" in their life, most of the students said that they owed full credit to their teachers and parents, but now the next step is to decide as to which university to study at. The School Management Committee, while lauding the high achievers and their parents, expressed that the superb grades obtained are indicators of the potential of the students and the commitment & hard work of the teachers. President SMC, Abraham George mentioned that when it comes to producing achievers, “we ought to chisel out the students’ talent for higher achievements.” He commended all outgoing Class XII students for their stunning efforts and wished them success in their future endeavors. Most parents and students mentioned that this spectacular achievement was a result of the consistent teaching and dedication of the Senior School teachers as well as the systematic remedial, high achiever and extra classes arranged by the school to make even the weakest students to score in full measures.